Enter Croatia! The border town of Babno Polje is nothing much but did provide us with water outside the cemetery. Cemeteries have proven good water resources as there is often a tap linked to the mains for people to water flowers around the graves. Less common in really hot countries but otherwise a pretty reliable source of water. 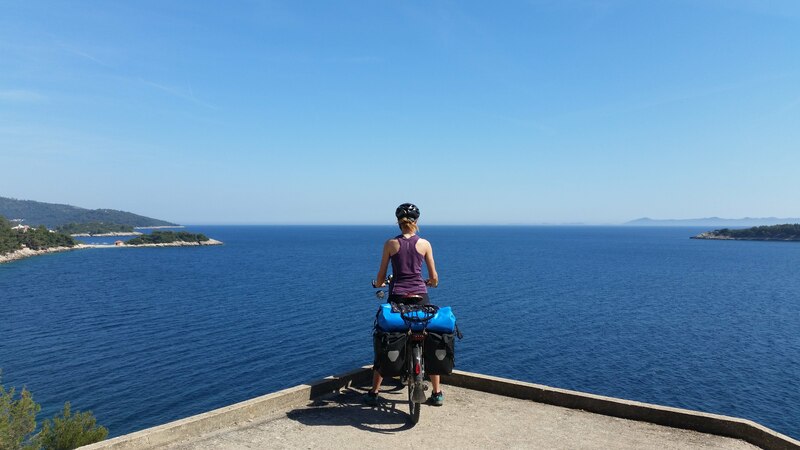 Our journey in Croatia started and ended with a good hill! Our route took us through the well stocked town of Gerovo where there was one of those signposts telling you how far you are from other countries - apparently 1201 kms to London and 18,128 kms to NZ. I presume this is as the crow flies as we’ve already done over 2300 kms from south of London! On recommendation from our Warmshowers host in Slovenia we went through Risnjak National Park on quiet roads through thick virgin fores where cuckoos and nightingales sung us to sleep. A mandatory lunch stop was taken at the ‘Vagabundina Koliba’ hut for a warming meal of wild mushroom soup, homemade sausages, roasted vegetables, thyme barley, polenta and stinging nettle balls - have to be tried. With full stomachs it was lucky that the next 10 kms were all down hill, fast, through magical old forests and then out onto the rocky cliffs above the ocean where the landscape completely changed to dry rocky scrubland. Traversing up high at 750m above sea level, past semi-wild horses the road opened up to the most fantastic belvedere, called the ‘Eyes of Vinodol’ with views across to the Adriatic Sea, still a beautiful sight despite the drizzle. The next morning bought sunshine and a fun descent into Senj, finally back on the coast for the first time since leaving St Malo in France 40 days ago! It felt so good to have the sea breeze on our backs and to know swim stops were coming! The coast road to Prizna was fairly busy but not too bad, I dont think it would be a good option in summer though. For the first time we started to see memorials on the side of the road and sadly witnessed a pretty bad accident en route which closed the road for a while. We found the drivers to be respecting in Croatia on the whole, but the memorials definitely make you more road aware. The ferry to Pag is only 15 minutes and you are instantly transported into another new landscape, almost moonlike it is covered in yellow rocks and boulders. Again, we were faced with the bittersweet reminder that we’d arrived off season - closed campsites, quieter roads, not a bad trade off. The main road on Pag however has quite a lot of trucks so we followed the ‘old road’ along the coast, past the ‘road closed’ signs, it was easy enough to walk around the mud barrier and was a pretty, if rather bumpy ride to the town of Pag. The old town has a very pretty square and beautful old 15th century buildings. Sheep on Pag, creators of the famous Paskisur cheese - worth a small fortune but delicious! 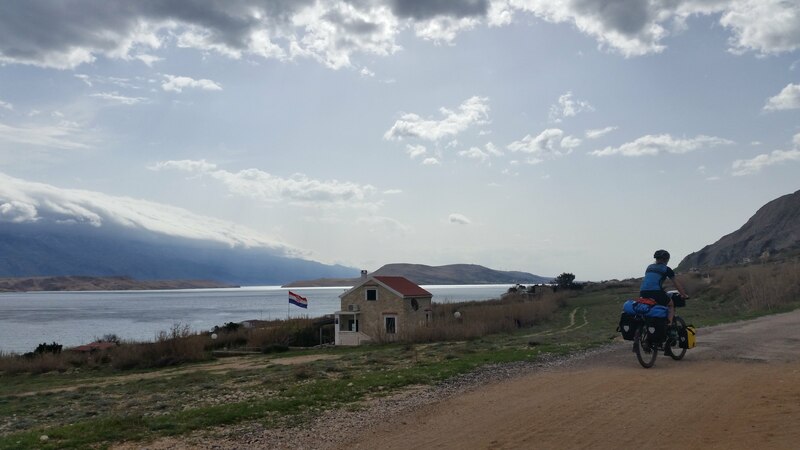 The ‘closed road’ to Pag town with the classic Bora wind clouds hugging the tops of the mountains on the mainland. Trying to avoid the main road again we took a gravel track around the salt flats. It was a numbered road but super bumpy and hot, hardwork so we joined the main road again, which you have to join anyway to get over the bridge to the mainland peninsula. By this stage the infamous Bora wind had picked up and was funelling through the gap making for a pretty terrifying bridge crossing. After a late lunch on the beach at Ritna we again tried a Jules special shortcut/avoid main road route. To be fair it looked OK on the map but after a few hundred metres we were both pushing our bikes up a very rutted mud track. View back to the bridge from Pag and across to Ritna where we ended up staying. 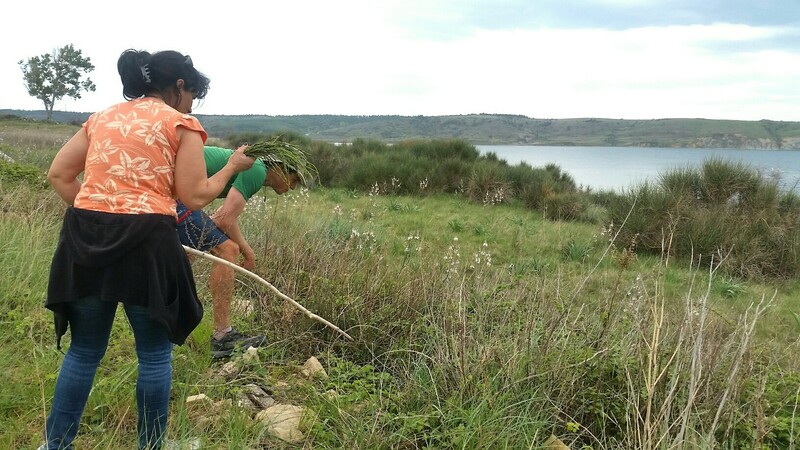 I always believe that everything happens for a reason, and if we had not persevered on this route we would not have met Sandra and Darko at the top who were out looking for wild asparagus. 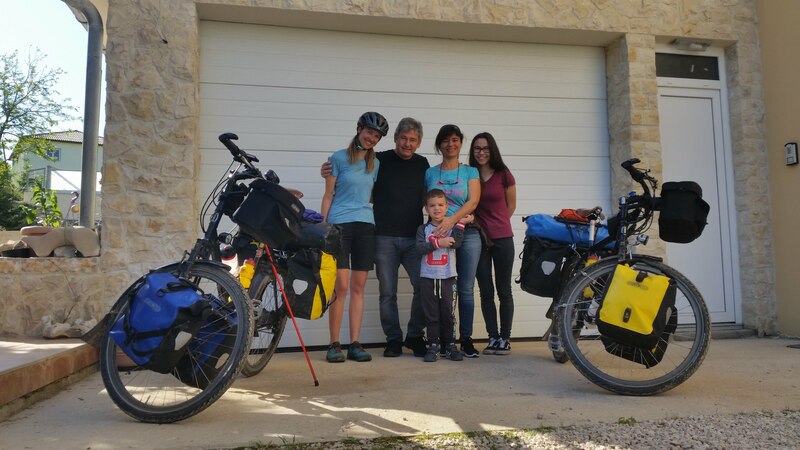 After 5 minutes of chatting they invited us to stay with them and we spent a wonderful two days with them and their family, relaxing, eating traditional Dalmatian food, hunting for wild asparagus and being shown around the beautiful Zadar city. They even named their baby tortoise Milly! It also gave us a chance to do a good sort and switch our wardrobes from winter to summer cycling apparel! It was an unbelievable kindness and we feel like we have made friends for life. The Croatians go mad for wild asparagus in Spring. Cycling along you’d hear a rustle in the bushes and see old women bending deep into the undergrowth in search of them. Jules picked up the knack pretty quickly! It’s much skinnier and more bitter than farmed asparagus. Sandra made a delicious asparagus and egg salad for us to try it. 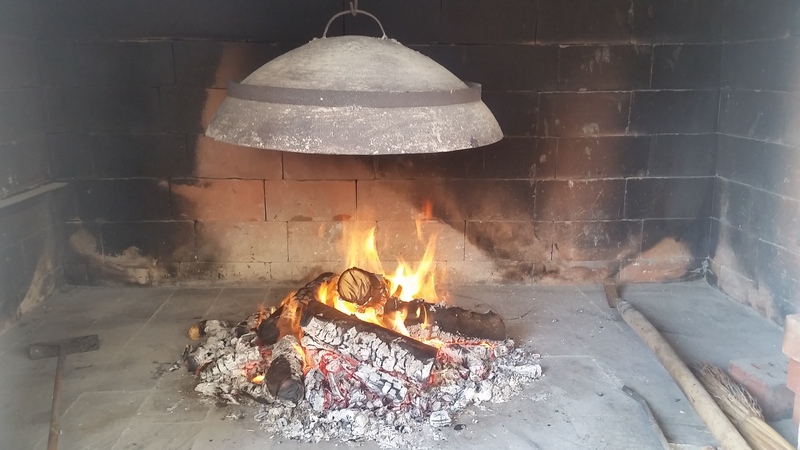 Traditional Dalmatian oven used to cook food under the large domed lid. 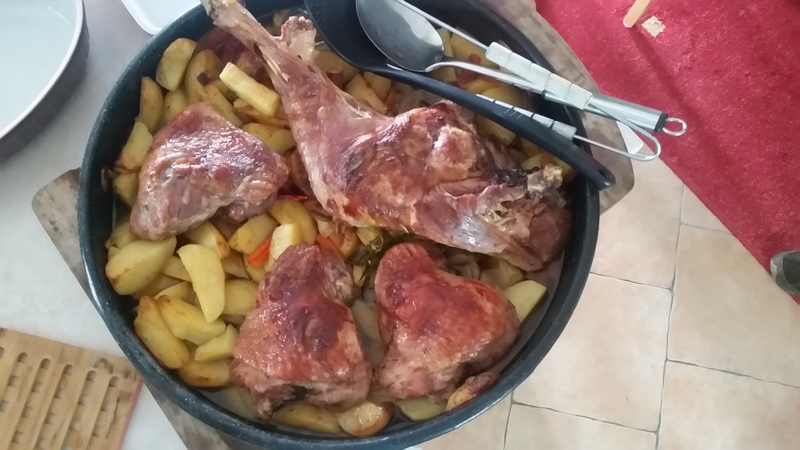 The large pan is filled with potatoes, peppers and carrots covered with meat and doused in homemade olive oil - delish!